Last weekend, St. Andrew Catholic Church was packed. As is usual for the 4:30 p.m. Saturday vigil this time of year, a standing room only crowd had gathered. A few minutes before mass started, Monsignor James LeBlanc left his spot in the entrance procession. Walking away from the staging area near the vestibule, he started strolling past the rows. Giving the hardworking ushers a big hand, he used his lapel mic to point out to the folks standing against the walls of possible seats within the pews. St. Andrew is not a small church. Msg. LeBlanc had probably went 20 rows deep, almost reaching the altar itself, before turning back around and meeting his altar servers and deacon back at the vestibule. You don’t usually see a pastor of a large parish take on the role of usher but then again you also usually don’t get the opportunity to be in the presence of a special priest like Msgr. LeBlanc. Msgr. James LeBlanc strolled past several rows of pews inside St. Andrew Catholic Church to try and find seats for the people standing. Try to picture this photo with an overflowing crowd. A parish is not defined by its pastor. Rather, it thrives or declines based on the faith of its community. To make this point perfectly clear, the Catholic Church does not keep priests around at one church for too long. Dioceses hand out new assignments to priests on a regular basis, uprooting them from one parish home and transferring them to another. It is by design that the names on a parish marquee won’t be there forever. However, it is still bittersweet when the priests move on. When Msgr. James LeBlanc announced he was leaving St. Andrew, both Sidney and I couldn’t help but feel sad. If you know Msgr. LeBlanc, the story about him navigating a crowded church to find seating for those on their feet wouldn’t surprise you. You see, the man just doesn’t fit the mold that some people might concoct of a Catholic priest. Msgr. LeBlanc made no qualms about challenging the congregation to sing louder or say a prayer with more conviction. He liberally exclaimed “AMEN” with the expectation that the congregation would respond with the same (they did). He opened up his homilies for discussion. He wasn’t always 100% politically correct. But even though he effectively smashed stereotypes that some people might have about how Catholic priests should serve and/or act, make no mistake about it, he was always Catholic to the core. He ran smooth services, gave beautiful homilies, displayed absolute reverence for the Holy Eucharist, and was very knowledgeable about any question you might have about Catholic doctrine. He made me proud about my faith; he made me confident to introduce Sidney to it. Sidney and Msgr. LeBlanc made quick friends. He helped make me comfortable to introduce Sid to the faith. St. Andrew is a tough assignment. Serving as an administrator for a large parish is one thing, it requires management and diplomacy skills. But St. Andrew is more than a big community. On any given Sunday, the crowd for that mass could be comprised of 75% vacationers and/or snowbirds. The constant revolving door of new worshippers can throw a wrench into a pastor’s plan for cohesion. Traditions that priests want to instill with their parishes become harder when the population changes drastically week to week. However, Msgr. LeBlanc successfully implemented the type of mass he wanted to run. More importantly, he served as a strong and holy man of faith for the thousands of people who travel to the Myrtle Beach area on a yearly basis. By giving a great impression to our visitors, he not only represented the parish well but the entire Diocese of Charleston. Sidney and I with Msgr. LeBlanc at his farewell party. As you can see, Msgr. LeBlanc was an incredible pastor when it came to Sundays. He mastered the responsibilities that many outsiders and even people of the faith think priests solely concentrate on. But Msgr. LeBlanc’s mass presentation, preaching style, and rapport with the audience weren’t the only things that endeared himself to so many during his time at St. Andrew. Rather, it was what he did on the days when the church wasn’t overflowing with people that made him stand out. 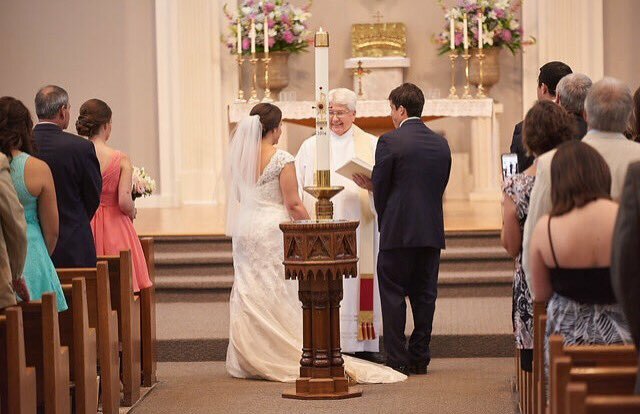 Sidney and I had the pleasure of getting married by Msgr. LeBlanc. In addition to listening to a workshop he gave on marriage in the Catholic Church that was open to the parish community, he also privately counseled us. About 10 days before our big day, we met with Msgr. LeBlanc in the parish offices. He blew us away. We chatted for almost two hours, a truly inspiring conversation that touched both Sidney and I. As Sid and I talked later that night, we both expressed how thankful we were for that special time. 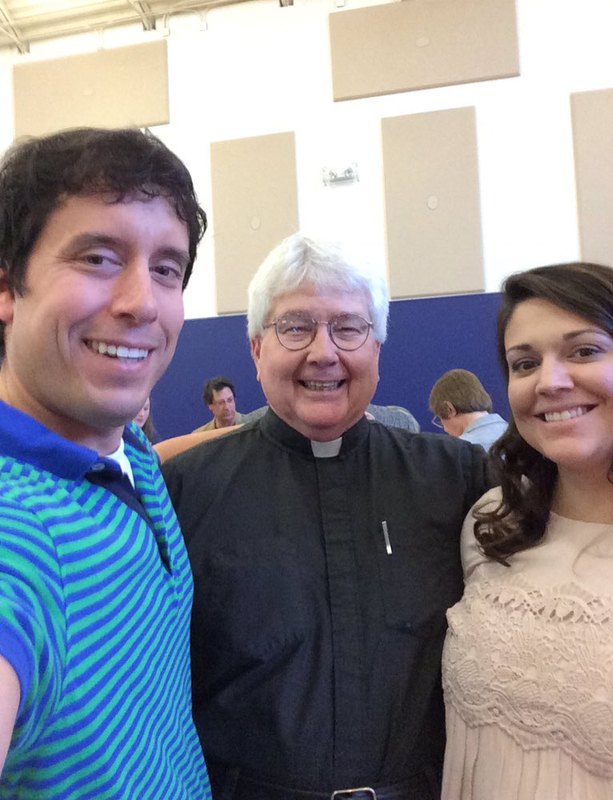 About 10 days before our wedding, we sat down with Msgr. LeBlanc for a very spiritual and memorable conversation. The day of our wedding was incredible. 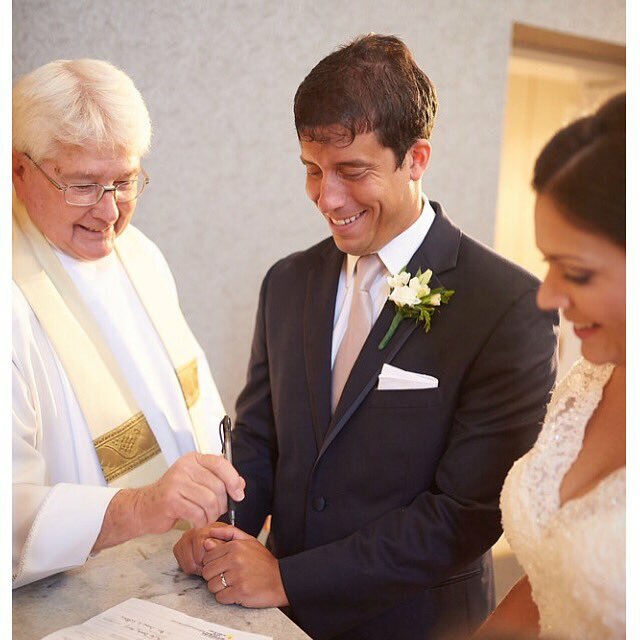 He squashed nerves, provided a sense of calm to the ceremony, and made it special from the entrance procession to the signing of the marriage certificate. He preached about how it wasn’t him that was administering the Sacrament of Holy Matrimony but rather Sidney and myself. 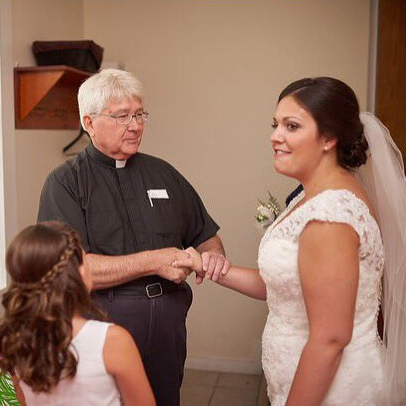 We will never forget him coaching Sidney’s 3-year-old nephew to give us the rings right before we said our vows. The moment where Msgr. LeBlanc coached our nephew, Harrison, to help with the ring delivery. Under LeBlanc’s guidance, Harrison held out the rings so they could be sprinkled with holy water and then he brought them to us. Whether it was listening to confessions, attending church functions, or pouring his heart into starting the area’s first Catholic high school, Msgr. LeBlanc gave 100%. He didn’t do it for recognition or praise, he just did it for God and the people of the parish. You see, they don’t come more humble than Msgr. LeBlanc. 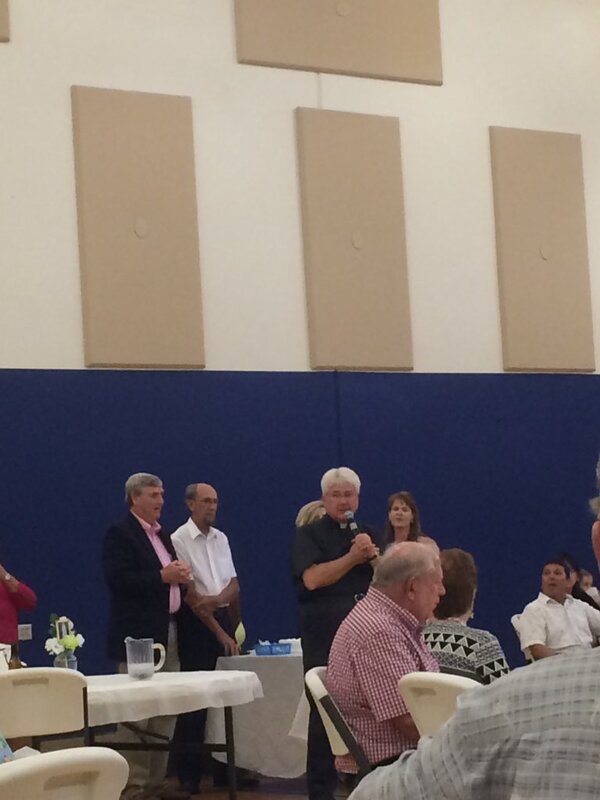 During the summer, a nice reception was held to honor his 20th anniversary to the priesthood. But the truth is that if parish officials had not learned about that milestone themselves at the last minute, Msgr. LeBlanc would have let it pass by without saying a word. He also said next to nothing (at least when I was around) about his elevation to the rank of Monsignor, a major and holy achievement in the career of any priest. 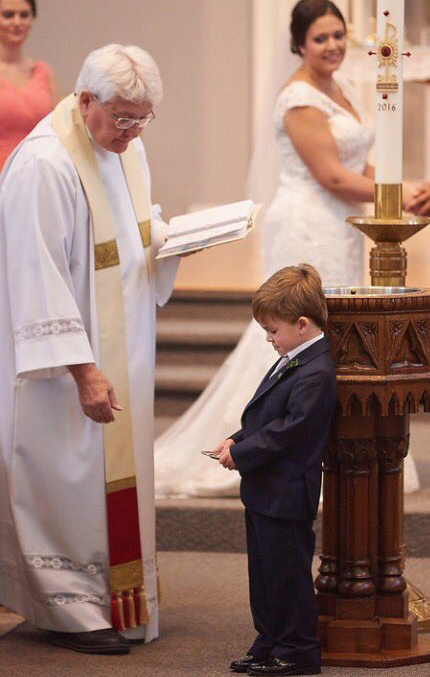 And, as I have been told, any gratuity he received for performing special ceremonies such as weddings went promptly into the collection basket at the next mass. Msgr. LeBlanc speaking at the reception marking his 20th anniversary of ordination to the priesthood. Msgr. LeBlanc is off to the Columbia area to become pastor of two parishes, Transfiguration Church and St. Theresa Church. Undoubtedly he will touch countless more people. Both parishes are very lucky. It goes without saying that the community of St. Andrew is so appreciative toward Msgr. LeBlanc. We are sad to see him go. On a personal level, I will really miss listening to him preach. I will miss the way he impacted Sidney, an influence that has helped her express to me that one day she wants to become Catholic. We will both miss him when it comes time for the baptism of our daughter. But more than anything else, we are just thankful. Msgr. LeBlanc touched and enriched our lives and we can’t express our gratitude toward God enough. Don’t Blink. This entry was posted in Uncategorized and tagged Diocese of Charleston, Father James LeBlanc, James LeBlanc, Monsignor James LeBlanc, Msgr. 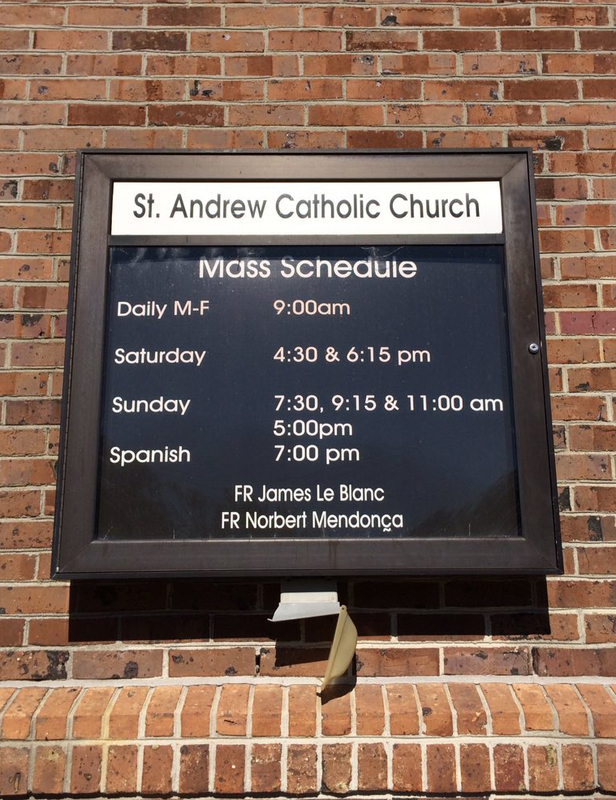 James LeBlanc, St. Andrew Catholic Church, St. Andrew Catholic Church Myrtle Beach, St. Theresa Church Winnsboro, Transfiguration Church Blythewood by brent. Bookmark the permalink. I could not have said it better myself! Thanks for reading.